Wild: Morellatops dromedarius seems to be a relative of both the Morelladon and Ceratops genuses, which in itself is rather strange. On top of that, it has developed to ability to store water in its humps like a camel. This makes it a critical part of the desert's food chain, as it provides predators with both food and hydration. Domesticated: When survivors discovered how to tap into the water in Morellatops humps without harming it, the docile creature became the desert's essential pack animal. Not only can it carry a good amount of weight, but it can provide survivors with a large, mobile water source that can mean the difference between life and death on any given journey. Known Information: Morellatops has limited options when it comes to self defense, so I would not recommend taking one into combat. 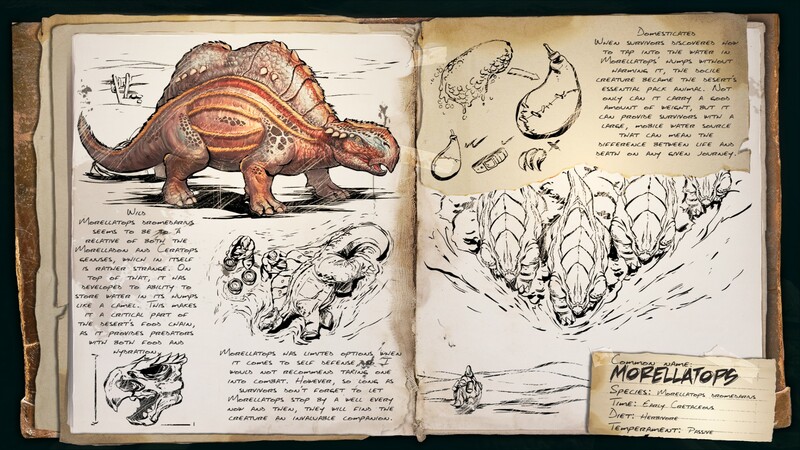 However, so long as survivors don't forget to let Morellatops stop by a well every now and then, they will find the creature an invaluable companion.